This is probably the most powerful, life-changing information for ‘Role Modeling’ other Internet Top Achievers to short-cut your way to Super Success…. Here’s how you can quickly and easily tap into the ‘BRAIN’ of these Elite group(50+) of Internet marketers ....without having to waste your time and money....on all the rehash ebooks and ineffective tools and resources. Your Way To Success On The Internet! "There are no shortcuts to success on the Internet -- but wait! I just read Richard Quek's brilliant 'ZOOM Your Way to Super Success,' and now I've got to admit that there are shortcuts. And they're all in Richard's outstanding book. If you want to get wealthy online -- read it." This is your opportunity to join the ELITE Internet marketers earning extraordinary incomes because they have developed a ‘PATTERN OF EXCELLENCE’ and do the ‘right thing’ at the ‘right time’. At last you’re going to be able to tap into the ‘MIND’ of this Elite group of Internet Marketers and ‘ROLE MODEL’ their Success. How much is SPECIFIC Knowledge and Information worth to you and your Online business? Suppose you could have 50 Top Internet Marketers as your Personal Coach and Advisers (YES this is not a typo error) within the next 5 minutes. These Experts are ready to spill their knowledge and experience for you. Will you be able to start implementing their ideas from the comfort of your own home to explode your online business? Imagine that you no longer have to suffer the pain of trying out all the Marketing Strategies that are ineffective and will not work for you. Imagine the amount of time and MONEY you can save? You can 'ZOOM' in on the strategies that work! You no longer have to attend the ‘School of Hard-Knocks’ and try out by the ‘Trial and Error’ methods. Well, it isn’t if you have the all the Success Information and Strategies at your finger-tip, all in one ‘Treasure Chest’. Think about it. This is absolutely the most important message that you’ll ever read that will have a life changing effect on you. It is a well known fact that 95% of those involved on the Internet do not succeed. Therefore getting the right and timely information from those who have done it successfully is very crucial to your Internet marketing success. My name is Richard Quek and I am a Chartered Accountant by profession and had been passionately involved with marketing on the Internet for the past 6 years. I am also a trainer and author of 5 books. These books are both in paperback copies and ebook version. The digital versions are promoted and marketed on the Internet from a computer in my bedroom. The Internet Money Machine - How to build your Super Digital Pipeline! EXPOSED! - 101 Proven Strategies to get more visitors to your Web Site in one day than most Web Sites get in a year. ZOOM to Super Success - How to ‘Role Model’ your way to Success on the Internet! I am running workshops and seminars on Internet marketing and have trained and inspired many Internet Newbies to success. Currently I’m charging a minimum of US$1,500.00 per person to attend my 3 days ‘Eye Popping’ and ‘Jaw Dropping’ TIMM Super Seminar. What are the best Products to market? How to create a web site that ‘SELLS’? How to Drive Massive Traffic to your web site? How to put your business on Auto-Pilot? These are the major problems that Internet marketers like you and me face regardless of our level of experience and expertise. Simply put, being able to do ‘the right thing at the right time’ is CRITICAL to your ONLINE SUCCESS! It could take you years and can cost you a small fortune to figure out just the right combinations that works to make your Online business a BIG SUCCESS– while others fall flat on their face. But instead of knocking yourself out trying to come up with just the right strategies to SUCCEED on the Internet, you can now have the 'MAGIC PORTION' inside this latest life saving digital book. How to ‘Role Model’ your way to Success on the Internet! At last! You now have the opportunity to discover and tap into the ‘BRAIN' and 'MIND' of the "best of the best" Internet Marketers, in one complete and unbiased ebook. One of the best way to short-cut one’s success is to Role Model those who are successful. Role Modeling is a proven success strategy. Those who are successful have developed a pattern of excellence that makes them a success. Most of them develop this success pattern ‘unconsciously’ – unconscious competence. 1. The ingredients that goes into the cake. 2. The exact quantity and quality of the ingredients. 3. The ‘SYNTAX’, ie the order in which the ingredients are put into the cake. Each of these experts has provided their own personal information based on 18 specially selected questions. Could you provide some information about your personal background? What do you think are the top 5 qualities that make you successful? What do you define as ‘SUCCESS’? What are the best products or services to market on the Internet? Please identify 5 and give your reasons. What do you think are the 5 things that make a web site sell? From your own personal experience, what are the best ways to get traffic to your web site? Please identify 5 and provide a few useful tips or strategies. For a person who wants to ‘copycat’ you, ie follow what you are doing, what advice would you give them? Please provide 5 useful tips. Could you make a recommendation of 5 software or resources that will assist in succeeding on the Internet? Please also provide the URLs. What is your personal opinion on the future of Internet marketing? Wow, I only wish that I had all these information provided to me when I first started my Online business. I assure you that the intention of this ebook is to provide you with both knowledge and inspiration. I strongly believe that knowledge and information is only ‘POTENTIAL’ power. It only becomes ‘LATENT’ power when you take ACTION and direct that knowledge to your specific purpose. And my friend, INSPIRATION and MOTIVATION is the fuel that will lead you to take the necessary action. "Richard, I'm asked to contribute to ebooks all the time, but I wanted to let you know that what you've compiled here is something really special. The way that you've split the book up into bite size sections covering each topic makes this extremely readable and the fact that you've gone to such a great extent to find contributors from some many different backgrounds makes this an invaluable guide. "WOW, Richard! You've put together an incredible ebook! Somehow you've managed to get some of the best-known marketers online to spill their guts about what marketing methods really WORK. These people are making BIG profits online and the advice they share in your book is PRICELESS! I highly recommend it to everyone looking for a good role model to follow online. If you follow the advice in this book, there's no way you can't make money!" I just finished reading your ebook, 'ZOOM to Super Success'. I really enjoyed the sections of some of the big boys. Very cool! And there were many links throughout the ebook to resources I was not aware of. Thanks! Richard, There is no better education for ANY internet marketer than to hear from those who are successful. There is no value better than this incredible book you have here. It is like having a collection of 50 of the most current and up to date ebooks from the internets top marketers all in one easy to reference collection at one low price. I was STUNNED when I saw the the quality of marketers that you were able to contribute to this great project and I jumped at the opportunity to participate. I have read the whole book twice and it is just a reminder to me that no matter what we think we know, we always have more to learn. Your book is a winner, maybe the best ever. Great job! I know that you’re probably still skeptical and a bit on the conservative side, but think about this – if you keep doing the same things over and over again – you’ll probably only succeed in getting the same results. That’s why I want to let you try out ‘ZOOM to Super Success’ – completely and totally risk-free! You don’t know how much I wish I could have had all this valuable information when I first started out. You are fortunate to have this valuable resource at your disposal. WHO are these Internet marketers who are so generous enough to contribute their invaluable experience, knowledge and expertise to this ‘One of a kind’ ebook. Get top rankings in major search engines such as GOOGLE, YAHOO, ALTA VISTA and MSN. Discover how to optimize your targeted keywords using BASIC RANKING Strategies. Stop wasting your time and money on all the rehash ebooks and information on Internet marketing. Discover the most effective and workable strategies from Experts. Get targeted traffic to your web site. Visitors who are looking for your product or service...who are ready to buy, if only they know what you're offering! Find out what are the tools and resources that will automate your Online business. Some of these are included as Free Resources in the ebook. Get Inspired and Motivated from the stories of these featured Internet marketers who pulled themselves up by their own boot-straps. Short-Cut the time needed for you to succeed by role modeling these Internet marketing experts. These 50 Experts Unselfishly share their strategies and thoughts on their own unique business and Internet marketing as a whole. Hi Richard: Your new eBook Zoom to Super Success--How to Role Model your way to Internet Success is absolutely wonderful. Wonderfully full of information that is!!! To have so much knowledge at one's fingertips is nothing short of wonderful--even for a seasoned internet marketer such as myself. Bravo to you for once again bringing a super high quality product to the internet community. This is one great collection of great marketing, business, and success tips -- I learn something new from each and every one of your contributors. They really delivered. I have to admit that you did a really great job for this eBook. Hats of to you for taking the time to contact so many Internet marketers and exchanging emails with them, then waiting for the answers. And you've been able to reach your goal. Congrats. The end product is really worth the wait. You've compiled a plethora of successful Internet entrepreneurs each with their own specialties and each one of them reveal some very interesting and different aspects of doing business online. Very enriching reading. PLUS their advice and experience are worth a goldmine to the newbie entrepreneur who should benefit enormously. 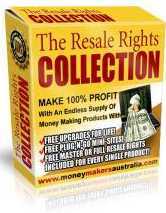 But I would say average marketers and the pros also will without any doubt get some profitable ideas in your eBook. Great resource - I've always said that the absolute best way to become successful is by following in the footsteps of experts - those who've already succeeded at your chosen endeavor. So in that regard, "Zoom to Super Success" is a *goldmine* for those looking to build their fortunes online! "The Original All-In-One Internet Marketing Solution!" Well, realized that this ebook could easily sell for $197.00. It contains more than 500 pages of 'Eye-Popping' information and success strategies. In fact if you asked any top Internet marketers to produce this ebook for you, you’ll probably be charged in the neighborhood of $297.00 to $497.00. I currently charge a minimum of $1,500.00 per person to attend my 3 day TIMM Super Seminar. So at bare minimum you’re getting thousands and thousands of dollars worth of information and resources at your disposal. Why am I practically giving this resource away? Well, it’ really quite simple. From my own personal experience I started my Internet marketing career on the wrong footing with no one to assist and advice me. I have learnt it the hard way – from the school of ‘hard knocks’. Therefore, I do not want you to wander through the same path. I want you to ‘role model’ the proven Internet Marketing Success Strategies that other Top Internet marketers and I have been using successfully. To sweeten the offer here are SIX FREE Bonuses for you when you ORDER NOW! This is a special package provided by Roy Oron. It consist of the JV Maximizer software plus 4 video tutorials, selling on his site http://www.jvprofitpower.com for $97.00. 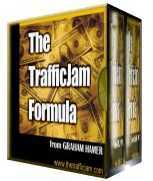 This is one of the best ebook on traffic generation. This ebook reveals everything you ever wanted or needed to know about using and installing pop-up windows to improve your sales and subscription rates. "New secrets to how you can discover the power of your motivation to GET the results you always wanted, so that you can achieve your goal successfully." Together these 6 free bonuses are worth $508.62. But they’re all yours absolutely free when you make your DECISION NOW! You'll also receive free updates from us in future. We will be featuring other top Internet marketers from time to time and you will receive these free updates at no additional charge. Oh! Before I forget… there are more than 50 other downloadable ebooks and softwares that are included in the ebooks that are yours for the taking. These are the personal gifts from all the contributors to this ebook. There is no way for me to put a value on these resources, but these are all yours for free with their compliment. WOW! 'ZOOM to Super Success' is a WEALTH of information for anyone that is looking to start a business on the internet. If you have a THIRST for KNOWLEDGE that will help build your Business, 'ZOOM to Super Success' is the e-book of 2004 for you! I was amazed at the information provided in this e-book through each interview! More than 40 Successful Internet Marketers/Program Owners share their "How they did it" that you can "Role-Model" after. Give yourself the "Edge" needed in this competitive business With 'ZOOM to Super Success'. This collection of personal success stories is simply amazing! Your Zoom-ebook will certainly be a great guide to those who want to achieve success on the Internet. It's not only a summary of marketing techniques as most of the participants even reveal their inner attitude they needed to get that far. Your ebook is the perfect mix between motivation and marketing techniques that achieve RESULTS! I feel privileged that I have taken part in this wonderful project!" ton of cool little tips just browsing through the other expert marketers profiles. Richard, you chose an awesome selection of experts to interview. Plus I absolutely love the way each section is based on a specific business model. You certainly provide ALL the right 'ingredients' for success in your ebook. ZOOM to Super Success was a great read and I'll certainly recommend it to my customers. I personally guarantee that if you seriously implement some of the strategies and ideas provided in the ebook you’ll definitely improve your Online business within the next 14 days. If within 90 days, you honestly believe I haven’t delivered on this promise then let me know and I’ll issue you a prompt and courteous refund. Plus, the free bonus gifts are yours to keep regardless, just for your trouble. That means you can try out all the ideas and strategies in ‘ZOOM to Super Success’ at my risk, while you see if they work for you or not. And if they don’t produce, I honestly want you to ask for your money back. And I’ll let you keep the free bonus gifts as a way of thanking you for giving ‘ZOOM to Super Success’ a try. There’s absolutely no risk whatsoever on your part. The burden to deliver is entirely on me. If you don’t produce the desired result using the strategies in the ebook then I’m the loser, not you. You really Can’t Afford Not To Invest In ‘ZOOM to Super Success’ - How to 'Role Model' your way to success on the Internet! Here is my limited time OFFER. For the next 500 orders that I received I’m giving a further discount of $80.00. That’s right you’ll only need to pay $67.00 instead of the announced $147.00. That’s an immediate saving of $80.00. There’s only one small catch. This offer is only limited to the next 500 orders. I cannot guarantee you how long these 500 units will remain. After that the price will revert back to $147.00. I’m sorry if you miss out…so hurry! Get ready to tap into the ‘MIND’ of these 50 Internet Marketing Experts! This ebook is MASSIVE...more than 500 pages 'goldmine' of information!! Give me my $80.00 Instant Cash Back Rebate. YES! 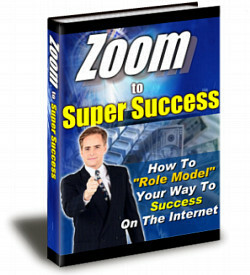 I would like immediate access to ‘ZOOM to Super Success’ - How to 'Role Model' your way to success on the Internet! ebook, so that I can learn how to apply all the proven Internet marketing ideas and strategies to my Online business. I understand that I'll receive the ebook in PDF format within the next 5 minutes. I also understand that I am entitled to the promotional price of US$67.00 and that my purchase is subject to a 90 days 100% Unconditional Money Back Guarantee. You’ll probably miss out on the $80.00 rebate. You’ll never know what are the secrets revealed by these 50 Experts? Your competitors who have this ebook will have the cutting-edged? I know that you are a person of wisdom and will make the right decision! P.S Just think! You’ll never again have to suffer through the pain and hassle of having to deal with the lack success on the Internet. P.P.S You are tapping into the ‘BRAIN’ of these 50 EXPERTS. This works out to ONLY $1.34 per person! P.P.P.S You get all the free bonuses valued in excess of $508.00 This excludes the Free Resources contained in the ebook. P.P.P.P.S You have my 100% ‘Iron Clad’ money back guarantee. Here are more endorsements for ZOOM to Super Success! stories. Events in peoples lives that will help, inspire and above all else mentor anyone towards thinking and applying success principles. For an ebook that is over 500 pages long I really enjoyed it. Usually I read 20 pages and ask for a refund. Well done. There are many Internet success books out there, and when I heard about this project for the first time, I had my doubts. I thought: Do we need another one? Now I have the answer: You bet we do. This is a goldmine! I think it’s Richard Quek’s wise approach that makes the difference. He’s invited such a variety of Internet marketers! There’s both the widely known and the complete unknown, there’s people from East and West, young and old, men and women. While reading all these different contributions, somehow, without me really thinking about it, it becomes much more clear how I can achieve success, what is my individual path. And that’s the whole point, isn’t it? On the other hand, there are a few extremely important factors that never change and that every one here mentions – it’s quite a wake-up call. Resources! Oh boy… All these Websites – Products – Books – Methods that are being recommended here. This is a cornucopia of tools and inspiration. And it’s not just the usual stuff you find everywhere. As a matter of fact I just found a perfect solution to a problem - something I haven't been able to find anywhere. I can’t wait to start implementing it. I know there are more surprises for me here, so this book stays on my desktop. I highly recommend it to any Internet marketer who wants to learn and grow. Everyone has their own style when it comes to online business and marketing. So being able to read how 50+ different marketers do it has given me dozens of new ideas. Sometimes we get caught up in our own little world and way of doing things. Looking at certain aspects from another angle has inspired me and helped me to better think outside the box. This is a must have resource for your library. The wealth of knowledge that is packed into all 507 pages is just spectacular. Whether you're just starting out or have been doing business online for years, I'm sure you'll learn something new with Zoom to Success." Your book is unique because you ask unique questions seeking different aspects and strategies and manage to show different facts and opinions on the Internet business, success, motivation, achievements and bring excellent resources on top. It's a great reading, guide and an absolute must if you want to get a real view of what is behind the curtain and truly succeed. I can highly recommend your book to everyone on the Net. Hello Richard, Let me be the first to tell you that your new Ebook, ZOOM to Super Success' is not just another read! It has helped me more then any information that I have found on the net for the last 4 years! Some of the information inside this wonderful Ebook will give you the Edge your looking for in Marketing and Advertising! This ebook should be in every marketers box of tools! Just AMAZING! And for anyone that is reading this, Don't miss out on the one book that will tell you the TRUTH about how to succeed with your business! Only one little thing to implement from the hundreds in the ebook, can change drastically the amount of cash you can make online.. Thanks for a GREAT ebook..
"Zoom To Super Success" is an awesome piece of work guaranteed to provide value to anyone wanting to succeed online. It's hard to find such excellent tips and even dirty tricks from so many expert marketers from all areas in one place, but you've managed to convince us to reveal our innermost mindsets and secrets...well done! "Whew! After spending three hours straight reading your ebook, I must say that it's a winner product. It covers all the bases and one single thing that impressed me the most is the 'free gift' idea. That's a nice touch to finish off each interview session. In my opinion, anyone who is serious about succeeding online should seriously get a copy of this 'cheat sheet'. What a Top-Notch Resource this is! Filled with hundreds of powerful ideas, thoughts, tips, tricks and secrets of dozens of successful internet entrepreneurs. It's really an encyclopedia guide that you will refer to again and again as you progress in owning and managing your own successful internet business. My compliments to Richard for having the patience and motivation in putting this whole amazing thing together. Well done! As the owner of www.HowToEarnALivingOnline.com, I too believe the best and easiest way to succeed online is to copycat the methods of successful online businesses and people. Listen to what they say, follow their advice and apply what they have done to your own business. We'll one can do exactly that by getting this incredible ebook full of interviews of some of the most successful money makers online. This eBook is a "Must Have" in anyones collection. Great Job Richard in putting together this incredible resource! 507 pages sounds like a lot to read, but I finished it wanting more. Honest, there's not a wasted page in your book. There's only one way to say it: 'ZOOM' is Top Notch! Not only did you ask your successful contributor's hard questions, about the inner workings of: Membership Sites; Training Sites; Affiliate Programs; Resale Rights and Business Opportunities, you got them to give you candid answers. I found Irena Whitfield's and Martin Franzen's business & personal outlook and knowledge especially profound. 'ZOOM' contains so many free marketing tools, free training resources and 'Insider's Tips' that it could take you months to use them all. 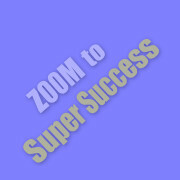 In fact, that's my only problem with "ZOOM to Super Success"... you give your reader's more than they could hope to use. My advice to readers: make a list of all the many different resources, tools and strategies, then prioritize them in the order you're going to test and use them in your business model. I personally guarantee you won't regret it!